Commemorating 15 years of our most successful bird feeder, we are now offering a Special Etched Glass Edition of our Songbird Lantern Classic. 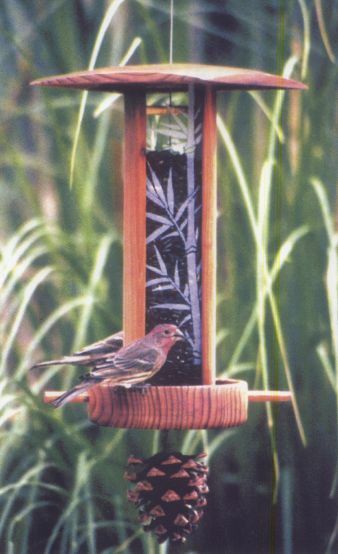 Our new Special Edition Songbird Lantern bird feeders feature two different etchings; natural bamboo on one side and a finch in the bamboo on the other side. This original drawing by Gary Schrodt is hand etched on the glass at the Schrodt Designs studios. These Special Edition Songbird Lantern bird feeders are handcrafted from quality redwood by the Schrodt Designs craftsmen in Oregon. It features a wind guard, an easy to clean bowl, and a pine cone for suet. Attracts Cardinals, Evening Grosbeaks, Finches, Chickadees, and other seed eating birds.Holds approximately 5 cups of seed.